Appropriately selected gloves can provide users with invaluable protection against hazards that might otherwise cause injury. In order to achieve the best possible protection, however, it’s important to understand how gloves for protective applications are categorised and certified. Gloves that are used for protection - with a very few exceptions - fall firmly into the realm of Personal Protective Equipment (PPE) and, as such, are covered by the European PPE Directive 89/686/EEC. Those protective gloves that do not fall within the scope of this directive are those intended for use in medical procedures. These are, instead, covered by the Medical Devices Directive 93/42/EEC. It is not currently permitted to supply gloves that are dual certified as compliant with the requirements of both directives. Moves are in hand to address this anomaly but, in the meantime, glove manufacturers often address the issue by supplying products which are identical except for their certification. Before leaving this topic, it is worth mentioning one area that sometimes causes confusion. Gloves classified as examination gloves sound as if they should fall within the scope of the Medical Devices Directive. Their intended purpose, however, is use in general cleaning work in areas where medical procedures are performed. Since this involves no direct patient contact, examination gloves are covered by the PPE Directive. In the remainder of this article, we shall only be dealing with gloves that are within the scope of the PPE Directive. As with all other products covered by the directive, these are divided into three categories, depending on the type of use to which they will be put. Gloves in the simple design PPE category, which is sometimes unofficially referred to as Category 1, are appropriate for providing protection where users are able to assess for themselves the level of protection provided against the risk involved or where the risks involved have effects that take place gradually and the user can safely identify the problem in good time to rectify it before it has serious consequences. Examples of gloves which fall into this category are those that are intended to protect the wearer against superficial mechanical effects - as is the case with gardening gloves - or against the effects of dilute detergents and other cleaning materials with weak and easily reversible actions. Gloves in the intermediate category, informally referred to a Category 2, are suitable for applications where a significant level of hazard is involved, and the hazard could lead to serious, but NOT life threatening consequences. An example would be gloves designed to protect the wearer from cuts and abrasions when moving boxes and materials around in a warehouse. Gloves in the complex design PPE category - or Category 3 - are appropriate when protection is needed against life-threatening dangers, or against dangers which could cause serious and irreversible harm to health, and where the user is unlikely to be able to identify the problem in sufficient time to avoid its effects. Examples are gloves that are designed to provide protection against the effects of aggressive chemicals, and those designed for use by fire fighters. Whichever category the gloves fall into, if they are to be sold in the countries of the European Union, they must conform to the appropriate standards, which are discussed in more detail later in this article, and they must bear the CE marking. The requirements relating to conformance and CE marking are different for each of the categories. For Category 1 gloves, self declaration is sufficient. This means that the manufacturer, or the company that imports the gloves into the EU, needs only to make a declaration that the gloves conform to basic health and safety requirements. The presumption is that suppliers will, nevertheless, produce the technical documentation needed to support their declaration. Only if a specific request is made by an authorised person or body, however, do they need to produce this documentation. 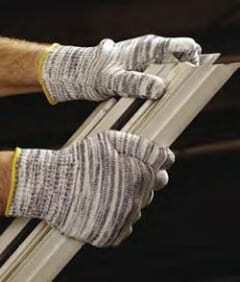 Once the self declaration has been made, the manufacturer or importer must affix the CE marking to the gloves. For gloves in Category 2, the requirements are rather different. In this case, the manufacturer or importer must arrange for the gloves to be tested to demonstrate that they comply fully with the relevant harmonised European standards, or with an alternative verified technical specification. They must then prepare detailed technical documentation and arrange for an EC type examination by a Notified Body. When the examination procedure has been successfully completed, the supplier of the gloves is permitted to issue an EC Declaration of Conformity, and to apply the CE marking to the gloves. A Notified Body is an organisation that, in the UK, has been appointed by the Secretary of State for Trade and Industry to carry out conformity assessment procedures. Similar arrangements for appointing notified bodies exist in other EU countries. A well-known example of an Approved Body for PPE products, including gloves, is the British Standards Institution. This organisation is authorised not only to support the issue of Declarations of Conformity, in line with Article 10 of the PPE Directive, but also to issue certificates for on-going quality assessments and audits, in line with Articles 11A and 11B of the directive. For gloves which are designated as falling into Category 3, the requirements are very similar to those for Category 2 products, except that a system must be put in place to ensure the quality of production is maintained. Typically, this will take the form of samples being independently selected by the Notified Body and tested under Article 11A of the Directive or an annual factory audit carried out by a Notified Body under Article 11B. So much for the categorisation of gloves intended for use in PPE applications, but what about the supporting standards? There are many of these, all of which are listed below, but one of the most widely applicable is EN 420:2003 Protective Gloves - General requirements and test methods. This provides details of such things as sizing and the assessment of the effect the gloves have on the dexterity of the wearer. This standard also describes in detail the test methods to be applied. For example, dexterity is evaluated by seeing how many dowel pins of a pre-determined diameter between 5mm and 11mm the glove wearer can pick up in set period of time. The results are translated into a dexterity level represented by a number between 1 and 5, where gloves with a rating of 1 provide the least dexterity, and those with a rating of 5 the most. Clearly, as there are so many standards relating to gloves, it is not possible to discuss them all in detail, but a few general observations, followed by consideration of key points from some of the more widely relevant standards, will be useful. One of the most interesting aspects of these standards is that, with a few exceptions, they are not material specific. Almost always the standards specify performance and test criteria, but give the manufacturer the option of choosing the most appropriate materials to achieve these requirements, provided only that those materials are not in themselves harmful. This approach is beneficial as it facilitates the adoption of novel materials such as fabrics with integral armouring, as well as the continued use of more traditional materials such as leather, rubber and nitrile rubber. It’s also worth noting the very many types of protection that can be provided by gloves. These include, for example, protection against chemicals, abrasion, needle stick, heat, cold, cutting with blades, micro-organisms and many other hazards. Note that for all the performance levels mentioned, low numbers indicate lesser performance, higher numbers better performance. This should not, however, be taken as a reason for automatically specifying gloves with the highest performance numbers. Lower rated gloves may well be the better choice, in terms of cost as well as in terms of all round performance, provided, of course, that the protection they provide adequately meets the needs of the application. Clearly there are many factors that affect the selection of protective gloves. Hopefully, this article has provided an overview of some of the most important, and further guidance is available for many areas of application. For example, a very useful guide to selecting protective gloves for work with chemicals can be downloaded free of charge from the publications area of the Health and Safety Executive website (www.hse.gov.uk/pubns/). Whatever the application, however, the basic selection procedure is always the same. Conduct a risk assessment for the application to determine whether Category 1, 2 or 3 protection is appropriate, then consult the relevant standards, determined from the list provided in this article, to find out what performance parameters need to be considered. Armed with this information, it should then be a straightforward task to consult suppliers’ catalogues and choose those gloves that are best suited to the task in hand.